Men love romance too. Of course they do. They're more often than not the masterminds of it. But they deserve something a bit extra special back, don't you think? When it comes to choosing anniversary gifts for men, it's all about knowing when to push the boundaries and when to rein it in. These gift ideas blend the essence of masculinity with the tenderless of love. Are you ready to watch him fall in love with you all over again? Celebrate a shared passion with a photo gift featuring the two of you together, doing something you both love. Is there a sport or hobby you enjoy together? Golf? Fishing? Boating? Gardening? Cards? This gift is all about acknowledging the quality time you spend together and never forgetting what it is that makes you click. Often it can be easy to get carried away with the hustle and bustle of everyday life that you forget to honour the things that you love most. A simple collage print like this is a wonderful opportunity to honour your best friend. The great thing about this template is that you can include two photos if you wish or use the frame at the bottom for a quote. ... finding the right grip. ... when she paints little red hearts on your golf balls. Say I love you with a work of customised art, something that will sit pride of place in the home for years to come. Find a photo of his favourite place in the whole world and print it onto split image glass for a truly stunning work of art. It could be somewhere nearby or a place you visited together and yearn to return to. Printing onto acrylic glass adds a touch of class and is perfect for photos that are bright, light and with plenty of colour. Indulge him in celebrating his love of all those things he fills his time doing - and that you handle with care. While you might give him a hard time for the sheer number of hobbies he's involved in, you respect his adrenalin addiction. This gift shows you truly understand. 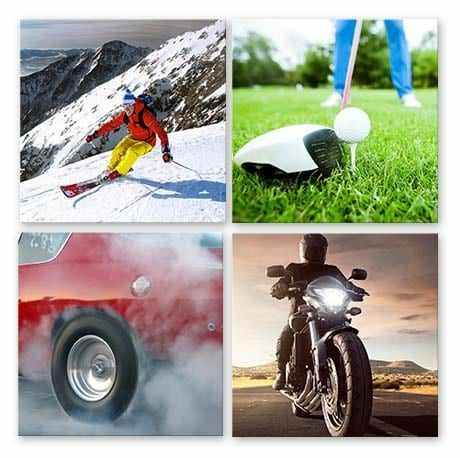 Print his top four extreme (or not so extreme) sports and activities onto a wall display. The good news is if you don't have the ideal photo handy, you can search our Canvas Art library. For full effect, print on masculine metal. It makes for one awesome print for the man cave or something he'll hang with pride in his office. Something to remember you by? What do you think? Treasure the romance of that European holiday each and every day with a gift that brings memories flooding back. Create a canvas collage featuring the best of the best highlights of that one special European adventure or create a collage series featuring all the amazing trips you've taken together. Warning! Travel collages are addictive. Once you build one, you will want to build more and more. The bonus is that they're super affordable. 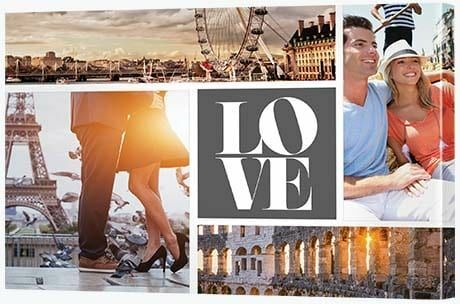 As well as this 'Love' themed collage template there's also a travel collage template that says 'Live. Travel. Adventure'. Is the man in your life a father to a new baby girl or boy? Bring out his soft side with a baby collage just for him. There are few things that will stop a man in his tracks than the love for his children. Watch his eyes light up when he receives this gorgeous gift, just for him. Show him how much you care that he's in your life and that of your new family together. This modish design featuring three frames is a wonderfully handsome template. However, if you'd prefer more or less photo frames to fill, be sure to check out the other modish template options as well as the traditional and silhouette collage collections. Also keep in mind that you can use a tool like Canva to create custom quotes that you can include in one of the frames. Oh - and don't feel you need to just include photos of him and baby. Include photos of you in the mix as well. Afterall, this is a gift that's all about family. If he's a lover of all things metal, embrace it by turning his reverence into art. Is your man always spotted with a tool in his hand? Does he live in his workshop, fixing things even when they don't need fixing? This gift is dedicated to that guy. Break into his toolshed and take a photo of something that looks like it could work as a piece of abstract art. 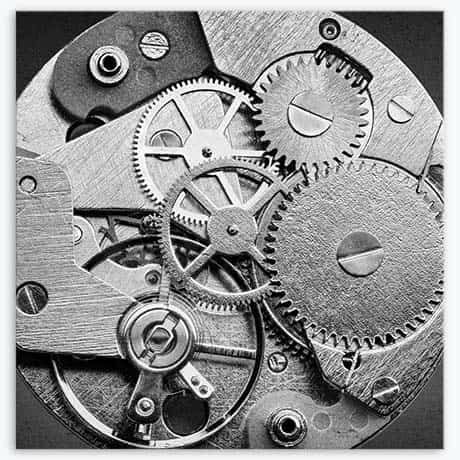 Zoom in as close as possible to a metal object or collection of objects and shoot away. Make sure it's a high resolution photo. The smartphone may not do the trick. The best choice of camera for a print like this is a DSLR. Set it to the highest resolution setting. Print it on brushed aluminium and you have every man's dream work of art. In the same way as giving flowers on his anniversary doesn't have to mean giving red roses, floral art doesn't have to mean pink bouquets. 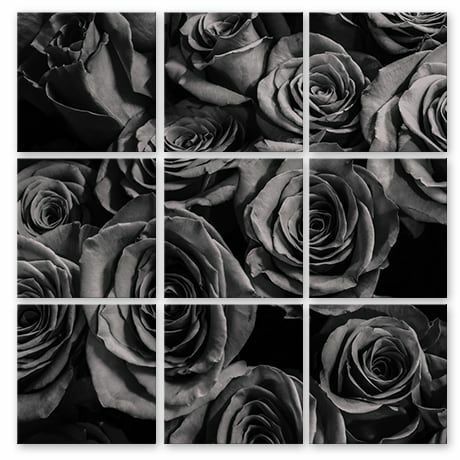 This split-image monochrome rose canvas oozes masculinity. If you can't find a black or grey rose picture, transform a colour photo into greyscale with the click of a button. Upload the colour photo into our canvas creator selecting 'canvas' as your material and 'split image' as your style then, once you get to the 'choose effect' section, simply select 'Gray' and your photo will transform into an edgy arthouse print. Printing across nine frames may be decadent, but it's your wedding anniversary! If now's not the time to splurge, when is? It will be totally worth it - and he'll love the gesture. Indulge in the wall display to beat all wall displays, one that celebrates everything he treasures about family. Collect all the fabulous family photos he loves. You know the ones - they're all over Facebook. 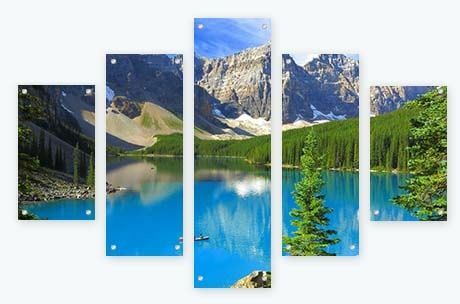 Gather together photos of people and photos of scenery to create an incredible, professional, eight-frame glass wall display. Bright, sunny, fun pictures look amazing on glass, so be sure to select 'acrylic glass' when printing your display. Reflect on one of the best days you've spent together - your wedding day - by way of a photo story. The day you got married was full of so many different activities and the photography to match. When we go to print our wedding photos onto canvas, we often forget about the boys. This photo gift is all about putting the groom's wedding day story front and centre featuring you - the blushing bride - as well as photos of the groom with all his mates in the wedding party. It doesn't matter if your wedding was last year, 20 years ago or 50 years ago, this gift will bring a smile to his face and a twinkle to his eye. 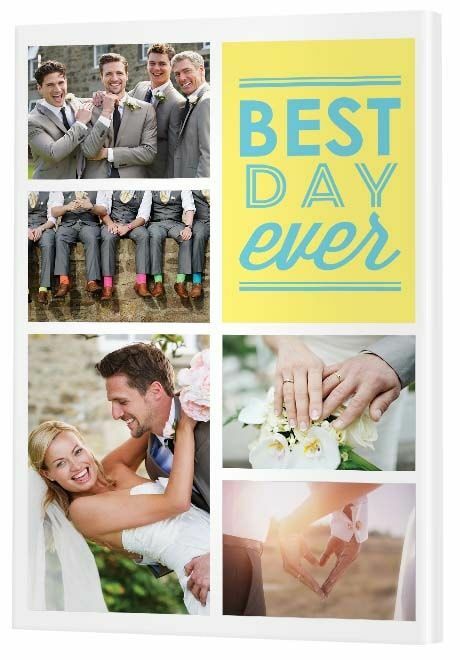 If you don't think the yellow and blue 'Best Day Ever' quote is quite his thing, the themed collage collection features a range of different quotes and colours. You can also choose to ditch the quote altogether and select a plain collage instead. The options are endless and it's a lot of fun to go through and pick and choose what will best suit your wedding photo collection. 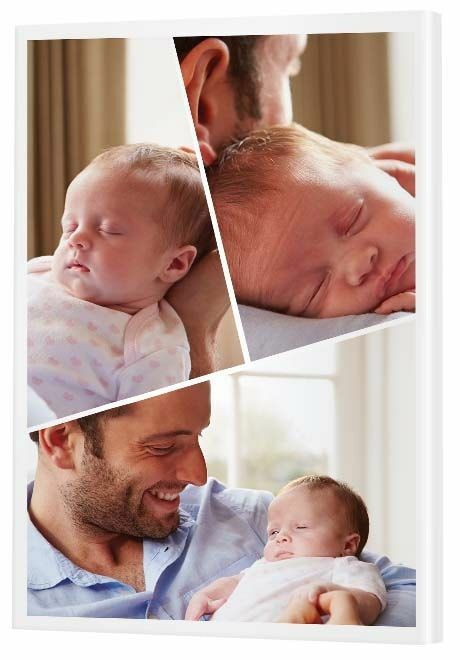 Surprise your husband with one of his favourite photos printed across four canvas frames. Is your spouse always taking amazing photos? Photos that he shares on Flickr or Instagram and never to be seen again? A wedding anniversary is your chance to spoil him rotten. 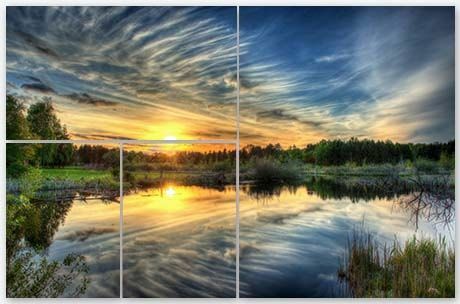 Take one of his wonderful creations - a sensational sunset for example - and split the stunning image across a number of different canvas frames. It will take his digital creation to a whole new level, something you can hang at home; a work of art. Brighten his wedding anniversary with a gift from the heart; a gift of photo art. 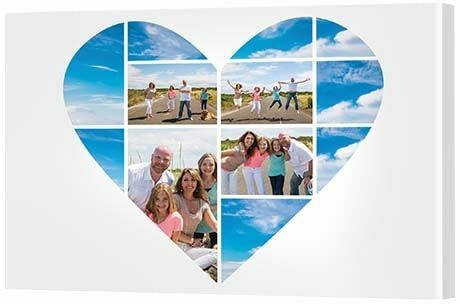 Show your husband he has a wife and family that loves him with a collage creation featuring everyone in the family. Perhaps it's a professional photo shoot you've had done or perhaps it's a collection of photos you've pulled together of everyone over the years. You might even like to include photos of extended family - his parents and siblings. Decorate the frame with an artistic element like the sky or perhaps a unique image that resonates with him. Something arty, funky and masculine?